Landmine safety awareness, HIV and AIDS education, health care and street kids’ issues are four of the toughest issues facing children and adults in the developing world. Communication is the key – but how do you get the message across in a culturally sensitive way? And how can you communicate with people who can sometimes neither read nor write? Most importantly, how can you also make an educational message so entertaining that it can’t fail to get through? The answer lies, among other things, with a puppet called Seamus, – and two Americans who were part of the creative force behind The Muppets. After consulting with friends and advisors from Afghanistan, New Yorkers Kathryn and Michael joined Johnie in creating a unique educational show, and a special range of puppets, for Afghanistan. Half of all landmine fatalities there involve children, so a cleverly constructed puppet show about landmine awareness can literally save lives. 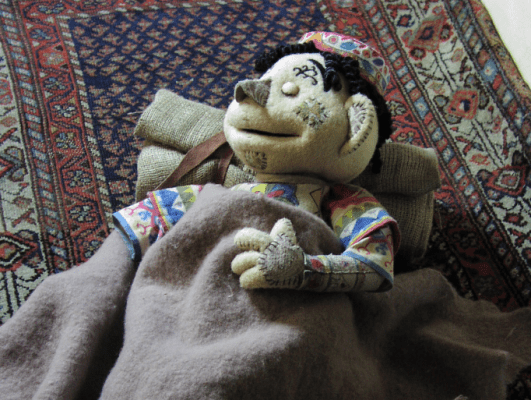 The show, Chuche Qhalin – The Adventures of the Little Carpet Boy – is ready for touring after a great deal of work by Michael and his wife Kathryn, who have created a number of new characters including one that is over sixteen feet tall and takes several puppeteers to bring him to life. After losing all her family as a result of war, a grandmother makes herself a new grandchild from the carpets she weaves. The subsequent adventures of this little carpet boy and his helper guide, Jaladul, tell the life-saving story of landmines and UXO’s. This is the story told on the new DVD recently launched by No Strings as a means of getting their message over to even more children living in areas where landmines are part of everyday life. For more information on the work of No Strings please visit: www.nostrings.org.uk. Please visit www.youtube.com/nostringscharity to view videos from the set. © 2000-2018 Goddess Media Limited. All Rights Reserved.